Since the woman card and the racist card won't work, I foresee some major coughing fits coming on. Don't forget, Hillary has the ENTIRE media behind her. Press, television, and undoubtedly the debate moderators. And God knows half this country has lost all common sense. I personally thought that was one barnburner of a fire in the belly type of speech. Best POTUS acceptance speech I've ever heard (and yes I remember Reagan's). I refused to watch it on the propaganda media and listen to the talking empty heads -- so I watched it on C-Span for my own sanity -- and so until this morning I missed all of the doom and gloom, DARK, bigoted, racist Hitleresque analogies I've been seeing all morning. Pfft. If that was a DARK, woe to the U.S., Trump's gonna be Hitler, etc. speech - then so am I!! Because I agreed with everything he said and CAN NOT WAIT to vote for this good man in November!!!!!!!!!!!! I wonder how many are aware that a large part of the problems seen at Ferguson, Detroit, Camden, Newark and be attributed to moving factory jobs offshore and moving the unemployed onto Uncle Sam's Plantation with its requirement there be no man in the house to qualify for bennies. 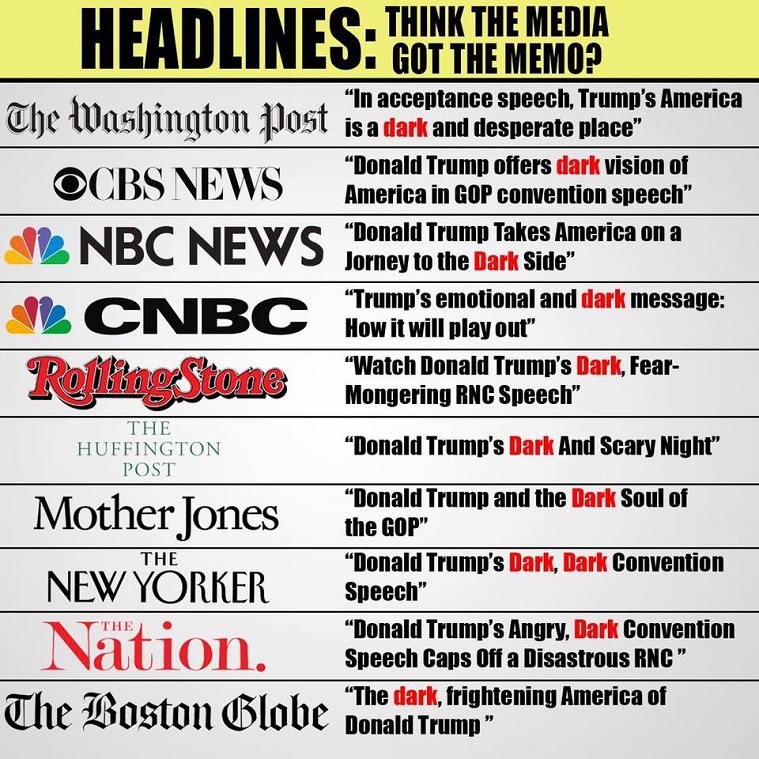 Pookie posted this meme that highlighted the collusion in the media's use of the word "dark" to describe Donald Trump's acceptance speech. Since they all said it, who are we to disagree? I posted a short blog I wrote on my FB page after seeing this meme. It can be found [here Today's Toons 7/26/16] at the bottom of today's Pookie's toons. "Big media, now solidly in Clinton campaign mode, tried to find fault with everything about the GOP convention. The Washington Post predictably called it "The GOP's convention of chaos." With choreography on par with Olympic synchronized swimming, other media outlets all had the same word for the convention: "Dark." If there was any skepticism about big media working in lockstep, this will dispel any doubt. "One man's "dark" may be another man's "optimism." CNN commissioned a snap poll the night of Trump's speech. To their surprise, they found that "[t]hree-quarters of Americans felt 'positive' about Donald Trump's convention speech." Positive is another word for optimistic. Only 24 percent of Americans said the speech had a negative effect on them, synonymous for dark." The media function like a herd of robots that periodically get their programming updated in real time. If there was any skepticism about big media working in lockstep, this will dispel any doubt. Revelations from the hacked DNC emails prove the same thing.